PUTTING YOUR FAITH AND TRUST IN THE LORD GIVES HIM ROOM TO MOVE IN YOUR LIFE! In January 2009, Ronnie was diagnosed with Stage 4 Non-Hodgkins Lymphoma and End Stage Renal Disease (Kidney Failure) and not expected to live, but God… ; in March 2011, Ronnie was diagnosed with Prostrate Cancer, but God.... On June 23, 2015, at midnight, by God's Grace, Ronnie received a kidney transplant! -Good all the time and all the time, God is good! -Looking for a Relationship with You! In 2006, after years of infections, suspected brain rumors and the like, Ronnie and Sharon Stricklin sold their home in Milwaukee, WI and moved to Arizona to escape the humidity that was blamed for causing his illnesses. Eighteen months later, another, stranger sickness began that took Ronnie's gall bladder. Doctor after doctor, hospital after hospital and seven different biopsies, no one had an answer or diagnosis. Unable to lie down in bed, and generating tremendous body heat that soaked the bed, Ronnie began "sleeping" on the couch in the living room. One sleepless night in September 2008, Ronnie passed out on the couch. Then, "the vision" began. "I was on a plane with Sharon, flying over the Netherlands. In the natural world seven years earlier, I had been on that plane going to, and coming from Salzburg, Austria on a ten day teaching and learning program with the Kellogg Foundation. Sharon was in Hawai'i, attending a conference. In the spirit world, she was on the plane with me. Suddenly, the plane began to soundlessly split apart, from the Captains cabin back. Just as suddenly, there was no one on the plane but Sharon and I. I said something to Sharon about surviving a crash-she didn't respond and never said a word or look worried. I looked at the split again and turned back to her. This time, I was on one side of the aisle and Sharon was on the other. The plane finished splitting apart! Sharon's side banked to the right and flew away in a normal manner. My side turned upside down and I fell out, hurtling towards the earth at tremendous speed. I thought, "This is how it ends?" I submitted myself to God. Inexplicably, I heard His voice say to me, 'I will take care of you.' My speed slowed to almost a stop and I floated down to the top of a church steeple. My landing was as if i was gently laid down in a bed of cotton. I looked down and an old man in bib overalls, with a handkerchief hang in from his back pocket was setting up a ladder to bring me down. Then, I woke up. When I woke up, a peace I hadn't known came over me. I had no fear of any disease and I knew I was not going to die. "Praise God!" 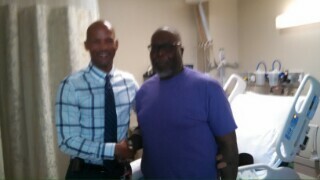 Evangelist Ronnie Stricklin with Transplant Surgeon Dr. Winston Hewitt at Ronnie's discharge from the Mayo Clinic Hospital in Phoenix, AZ, June 25, 2015. I continued to struggle with the illness, getting worse and worse. Finally, January 2009, I allowed Sharon to take me to the Mayo Clinic of Arizona for "complete evaluation and treatment." Several days later,the diagnosis came back--4th Stage Lymphoma and Kidney failure. To complicate things, I had unknowingly been terminated from the job, and my insurance was terminated along with the job. We found out when being admitted to the hospital. Sharon was between jobs and had no insurance. The Lord, however, was moving again in our lives as we got help to apply, and receive Cobra, a partially government insurance program on our last day of eligibility. First He saves me from the enemy, then He provided insurance! God IS good! For we walk by faith, not by sight. I began treatment at a dialysis center only a few blocks from our home in Mesa. Eventually, I began sharing my testimony with patients, nurses, technicians and everyone else who stopped by my station to hear for themselves what others were telling them. I had began intense bible study to understand more about the Lord and His will for us. I began praying with people and evangelizing right there in the dialysis chair, Sharon teased me that I had started a "Dialysis Ministry." I couldn't argue! March 2011 came and I was being processed to join the list of people waiting for a kidney transplant. I had a new primary physician and he insisted on me going through a complete battery of tests because, "We've done to much to pull you through to let something happen to you." Weeks later the test showed abnormally high Prostate Specific Antigens (PSA,) meaning something was not right. I submitted to another biopsy, of my prostate, without anesthesia, the only way it can be done. Think of surgery without drugs! The urologist would call me with the results. A couple weeks later, Sharon and I were meeting with the Mayo Clinic Transplant team, when they informed that I would have to wait two years, after I was through with Prostate Cancer. WHAT??? We had received no notice from the urologist. The Transplant team was embarrassed and angry. We. Were. Angry! I had surgery to remove the cancer and began the long road back. This time, no chemo for the cancer was confined to an area in a non-organ. I had accepted an invitation to give my first public sermon in Milwaukee at New Creation Church Ministries, for Pastor and First Lady Jeff and Theresa Harmon, old family friends, on Father's Day, Sunday, June 21, 2015. We left our apartment in Lombard Saturday, June 20th and stayed in a hotel in suburban Milwaukee. Many family and friends, in addition to the church members were in attendance to receive the word. My topic was "Faith, It Is About Trust!" My main point was "Putting Your Faith and Trust in the Lord gives Him Room To Move in Your Life." The message was well received because it spoke directly to a lot of those people who did face and were facing challenges in their lives. We spent time afterwards praying with individuals and sharing God's moves in our lives. The rest of the afternoon, we were guests of the Harmon family. We finally returned to our hotel that evening, well spent, but joyous at how the Lord was with us. The next morning Monday, June 22nd, my cell phone started ringing at seven am. I did not recognize the area code and did not want to get up, so I let it go to voicemail. The Holy Spirit would not let me return to sleep, so at Sharon's urging, I checked the message. "This is the Mayo Clinic in Arizona. We have been trying to reach you to offer you a transplant of a kidney we have received. You have thirty minutes to call us with an answer or we will be forced to select another person." Whoa!! We called back and asked for a few minutes to confer. We prayed together to seek God's permission and He gave the okay. We called and agreed to get down there immediately. We left the hotel at eight and drove to Chicago's Midway Airport where there were more flights to chose from. We did not stop at our apartment, parked in the airport lot and left with the clothes on our backs. We missed the first flight and caught the next, with a forty minute layover in San Diego, finally getting to Phoenix at eight that night. There we rented a car and drove to the hospital, getting there at nine. I was admitted, processed, and prepped for surgery. At midnight Tuesday, I was on the table for the four hour surgery. I woke up in my room around seven am. with a new kidney! All I could do was praise God and think about "Putting Your Faith and Trust in the Lord gives Him Room to Move in Your Life!" It was less than a day since I had delivered that message and He moved in our lives immediately!